Masteller cites Mike and Mike as a show that excels at providing smart content. Talk show hosting is the most difficult genre of sports broadcasting to master. It’s not even close. Not only are the subtleties of sports talk hosting not taught in schools, but many program directors don’t teach it either. They either don’t know how or they don’t make the time. One guy who knows sports talk radio as well as anyone is Scott Masteller, Sr. Director at ESPN Radio Network. He’s a George Whitfield for sports talk hosts. Scott spoke last year at STAA’s One Day Ticket to Sportscasting Success seminar. 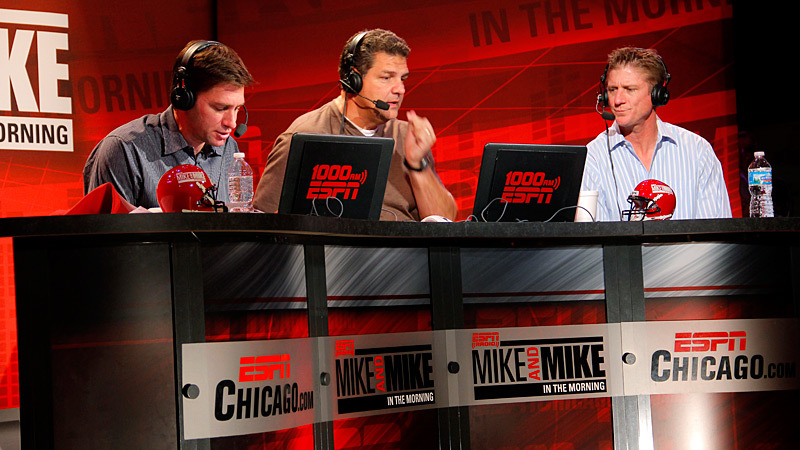 What follows are some of the tips he shared for improving your sports talk show. Look for a bonus post with Masteller’s tips for getting your next gig on Friday. “There’s a lot of talent out there but there’s very few that really, really totally cut through,” Masteller says. He cites Colin Cowherd and Mike and Mike as examples of shows that excel at providing smart content. Failure to prepare is preparing to fail. “[Colin Cowherd] writes out what his thoughts are going to be, where he’s going to go with them, and how he’s going to tell stories,” says Masteller. Of course, you must be willing to deviate from your plan in the event of breaking stories. The most important skill a sports talk show host can possess is giving opinions with a foundation. Things like actualities from newsmakers, audio drop-ins, and callers break-up the monotony of a single voice. Masteller advises that, even after three minutes of great content, listeners start to fatigue. Using production elements helps keep them engaged. Scott Masteller will be a keynote speaker and part of a panel critiquing sports talk radio demos at STAA’s upcoming One Day Ticket to Sportscasting Success seminar. If you are interested in participating and potentially having Scott listen to your stuff, click this link. Lots of good points, but despite all of Colin Cowherd’s preparation he loses me with his arrogance. John Feinstein on CBS Sports is much better in that time slot now.